Valancy Stirling has lived for 29 years controlled by her mother and bullied by her extended family. Valancy’s life changes when she is told by her doctor that she only has one year to live. She keeps her condition a secret from her family to avoid their attempts to control her further and starts living her life the way she wants. Valancy’s family think she’s become crazy as she starts to speak her mind and behave in what they think is scandalous. Lucy Maud Montgomery is one of my favourite authors. She is most known for writing the Anne of Green Gables series. I thought that the Anne series were the only books that she had written. However, I was pleasantly surprised to learn that she had written more books. This book is the first I have read from L. M Montgomery where the main character wasn’t an aspiring author and it’s a book for adults. 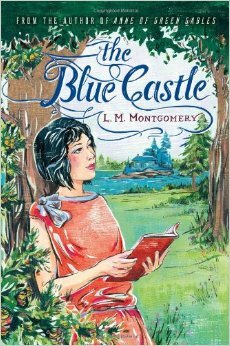 I was worried that the Blue Castle would be this depressing book where Valancy doesn’t learn to stand up for herself until the end. Fortunately, it wasn’t the case and the story gets that over with right near the beginning. I find this book highlights the bohemian lifestyle that was emerging in the 1920s which was a change for L.M Montgomery sentiments for the Victorian era. It was interesting to see what was considered scandalous in the 1920s, the era that the book is based. The things that Valancy does wouldn’t be an issue today. She goes to stay with a woman who had a child out of wedlock and marries a wild and reclusive man. Valancy is a strong female character who challenges stereotypes. She has some idealistic qualities that are featured in most of Montgomery’s heroines but seems more grounded than Anne Shirley or Emily Byrd Starr. However, she still gets caught up in raptures about the Canadian wilderness just like Anne and Emily. I can see how some readers might find the moments where the characters are made breathless by the sight of the light shining into the meadow or forest tedious. But at least she doesn’t get tears in her eyes from the sight like some of Montgomery’s heroines. I wish there was a sequel to this book but it ends well. I hope it becomes more popular in time too. I recommend this book for fans of L.M Montgomery. This sounds like a really good book about living life the way you want to and not letting anyone else control you or what you want. I am glad the main character has such a mindset change! I hope you read The Blue Castle one day. I would love to read your thoughts on the book.